I didn't mean to do it. But I was out today (running basic errands, not participating in the Black Friday insanity, thank you very much) and it was cold. Really cold. And you are, relatively speaking, so far away. I needed hot caffeine, and, well... she was right there. On the Pike. Big green sign with the mermaid-y chick luring me in. And I answered her siren call, dammit. It's Starbucks Peppermint Mocha season, and I was sucked in. It's so tasty, you see. And so nice on a bitter, windy day. It was all of 25 degrees out, and I needed something cheerful and overly sweet. And, dear Mayorga peeps, I hate to say it, but it was good. Really good. Really, really decadently good. here it's bridgehead coffee that is the local business i love to support. 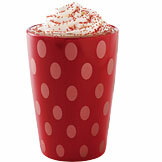 but the starbucks, especiallly with their holiday drinks, is such a tempting mistress. peppermint mocha. eggnog latte. gingerbread macademia nut biscotti. all terrible for me. but i love so much. so, so much. "It's not personal. It's business." There's no room for guilt in my coffee.